watching my two little boys grow up is hands down the most rewarding part of being a mama. mainly because there are so many firsts! first smile, first laugh, first steps, first favorite super hero... they are all so good i really don't have a favorite. ok, ok maybe first laugh. that one was very rewarding and both times came in the middle of that newborn phase when i really need the reassurance the most. to me it solidified that my babies actually liked me! it can also be a bit bittersweet once a milestone comes and soon becomes a regular thing (i am happy to report that both max + knox laugh uncontrollably as the time now). it's a mixed bag of wanting your child to develop new skills but also trying to slow down time. but it ain't over yet. i know i have a lot more firsts to come with the boys. right now maxwell can put pants and shoes on by himself but needs help with his shirt, has been an avid jumper for months but still holds my hand when launching himself off boulders or walking into preschool. knox has yet to take his first solo leap (he'll jump plenty into my arms though!) but he wants it so bad. 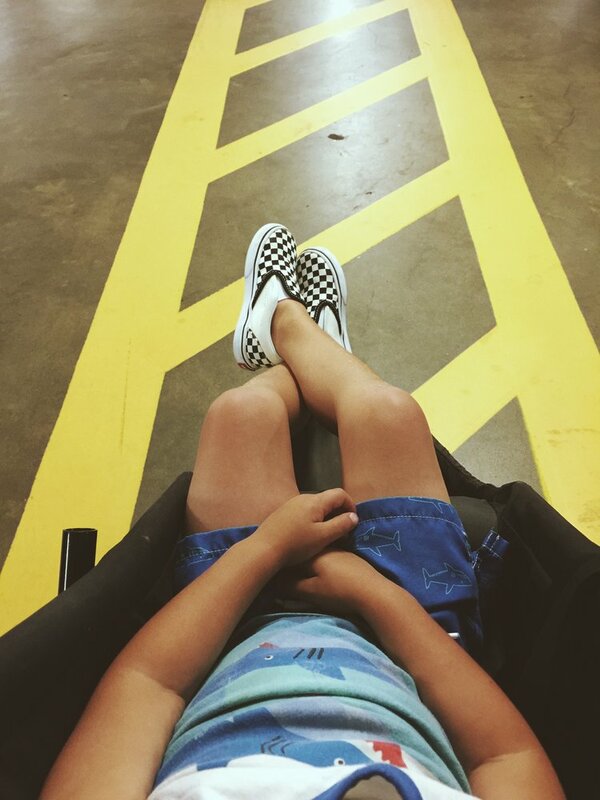 strollin' to the playground in max's first of many pairs of checkerboard vans. so i should mention the boys are in their swim clothes because the original plan was to visit the splash pad. long story short THAT didn't happen so this quickly became plan b.
you totally got this knox. good effort though! also, hysterical as usual. meanwhile... maxwell is really agile! i am always impressed by his jungle gym skills! biased you say? well of course! i am not mad about it! all of their running around really keeps us in shape, right josh?! the heavier they get the better the workout i say! see?! looking fit there joshy! they were totally unimpressed when i leaped over their heads. i guess i can't compete with a row of ants. hrmph. as you can see, observing boyhood unravel right before my eyes is incredibly special and fun. standing by my boys as they forge their own passage through childhood is unlike anything i have ever experienced. each and every day, i feel so damn lucky. and i can't wait to see what they do next. finally the longest week ever is OVER.